Caster type: 3", 2 fixed, 2 swivel, 1 with brake. Load capacity: 350 lbs. 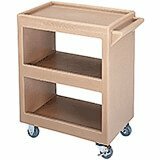 These all purpose service carts are durable and dependable workhorses. Both versatile and functional, they're easy to maneuver, easy to clean and rust resistant. 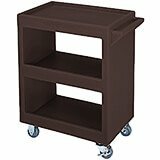 All are one piece polyethylene units with molded in handles and shelves and bolted in casters. No assembly required. 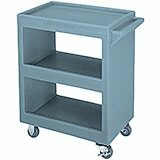 28" x 16" x 32-1/4"
These all purpose service carts are durable and dependable workhorses. Both versatile and functional, they're easy to maneuver, easy to clean and rust resistant. All are one piece polyethylene units with molded in handles and shelves, open sides and bolted in casters (3, 2 fixed, 2 swivel, 1 w/brake). No assembly required, load capacity: 350 lbs.